" A Smart hub for the Automation Solution, Software and the material supply "
Established in 2015, Imax Technology has gained a remarkable position in Manufacturing, Exporting, Supplying, Distributing and Trading a wide range of Waste Water Treatment Plant, Tube Well Pump Automation, LV and MV Panel, Water Treatment Plant, Centralized Street Light Automation, Starter Panel, Intelligent Pump Controller, Water Pump Control System, SCADA System, Soft Starter, Street Light Automation, and Motor Protection. 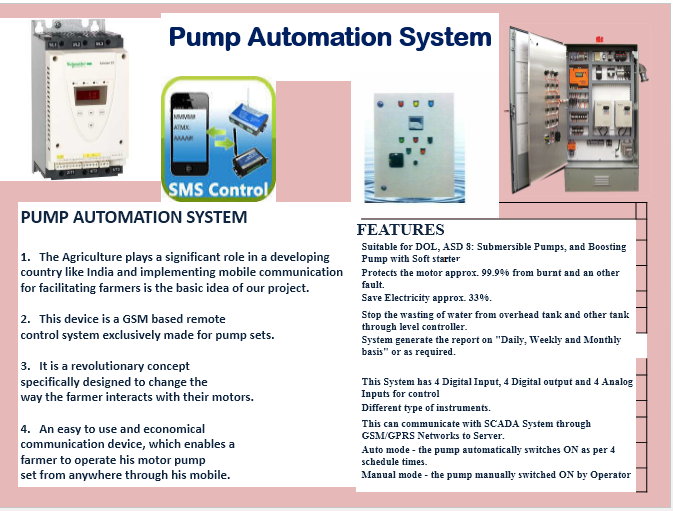 Our product range includes Uni-Advance Starter Panel with GSM Controller, Starter Panel With Timer, Starter Panel with GSM Controller, Energy Efficient Pump Starter Panel. All products are highly applauded in the market owing to their, easy operations, resistance corrosion, longer waking life, reliable performance, low maintenance and affordable rate. Our offered products are precisely developed using the top quality raw material and sophisticated equipment. To keep the industry standards, our products are developed under the direction of industry experts, who have rich industry knowledge. Moreover, in order to supply the best quality of products, these are checked on dissimilar quality parameters using sophisticated techniques. Moreover, our firm has knowledgeable professionals who give full support to get the business aim in effective way. Apart from, due to knowledgeable professionals, we are capable to install these products at our clients site in effective way. Moreover, we follow worldwide standards in the engineering of our products. Moreover, we have highly developed manufacturing unit, which is settled with sophisticated tools and machinery. Furthermore, our ethical business policies, honest dealing, affordable prices, optimum quality of products has helped us in maintaining well-known position in the industry. Furthermore, for the customer easiness we accept numerous types of payment option such as Online, DD, Cash, Cheque, and Credit card. Under the command of our mentors Mr. Syed Akbar Ali /Eijaz Anwar, we have obtained our business objective in proficient way. Skilled and semi skilled worker. Motor Safety through Quality, Reliability and Innovation, Government Software provide to all department. To Be a Global Player in Digital Motor Starters,Softwares and Solutions.